This Afternoon (Tuesday): Plenty of sunshine, but remaining cold. Highs in the mid to upper teens. Overnight Tuesday Night: Mostly clear skies with lows in the lower teens to single digits in the suburbs. Tomorrow (Wednesday): Warmer with highs in the upper 20s under mostly sunny skies. A Winter Storm Watch has been issued for much of eastern New England ahead of a storm brushing the region on Thursday. Meanwhile, a Wind Chill Advisory has been issued for many counties across the region that will see wind chills to range from 5 degrees below zero to 30 degrees below zero. On Tuesday morning, low temperatures dropped to 33 below zero in Whitefield, New Hampshire, and even the suburbs northwest of Boston along Interstate 95 dropped 10 to 15 degrees below for a time, making it tough for some cars and buses to start. That kind of cold is unlikely to repeat this upcoming night, as partly cloudy skies and slowly, slightly moderating temperatures take hold, with lows in the single digits and Wednesday daytime highs of 25 to 30 degrees, which will feel pretty good after the recent cold weather. Meanwhile, a seemingly innocuous but energetic disturbance over Montana on Tuesday is diving rapidly south and will hit the Gulf of Mexico by Tuesday night, picking up moisture and turning the corner for a wild ride just off the East Coast on Thursday. 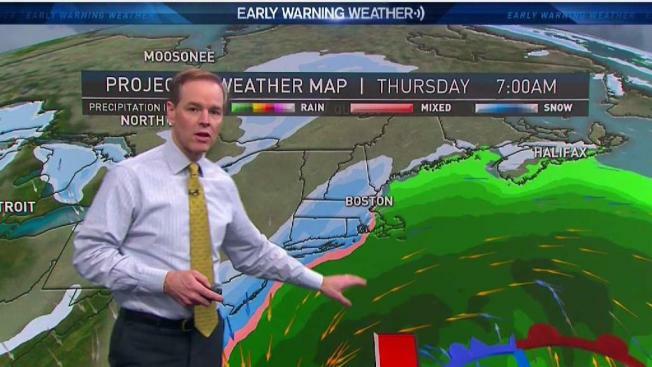 Though the storm core — packing wind gusts of over 90 mph — will stay over the ocean, such a monster storm will still deliver an impactful punch to New England, with snow beginning between 4 and 7 a.m. Thursday, falling heaviest from 9 a.m. to 5 p.m., wrapping up around 10 or 11 p.m. and dropping at least half a foot on Eastern New England, with some areas likely closer to a foot. Though we escape the strongest wind, gusts over 50 mph will be possible at the coast, leading to some power outages and the potential for blizzard conditions in some coastal areas. Waves will combine with a high astronomical tide for pockets of moderate coastal flooding around midday Thursday. The Massachusetts Emergency Management Agency is already warning of hazardous travel conditions on untreated bridges, overpasses and secondary roads. The MBTA and Keolis, which operates the MBTA's commuter rail, said they are taking steps to reduce the impact of the storm on regular service. But they said delays are possible if the weather conditions deteriorate. Behind the storm, intense arctic air returns Friday and Saturday before another storm comes knocking early next week in the exclusive Early Warning Weather 10-day forecast.